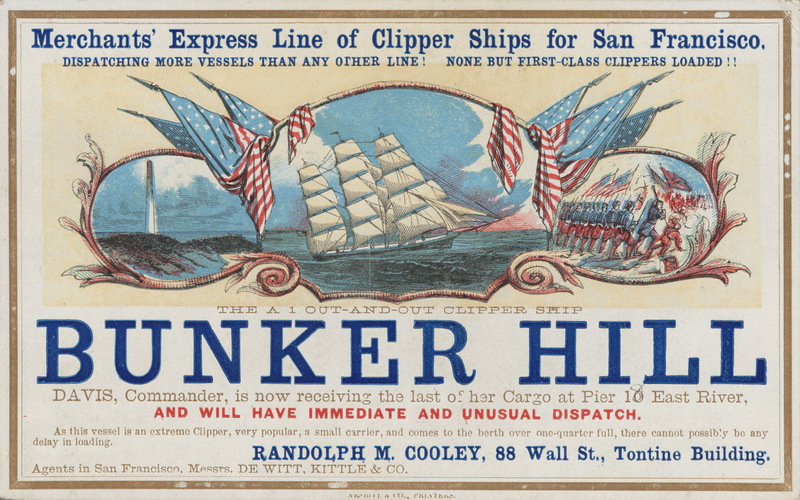 Sailing card for clipper ship Bunker Hill, circa 1860. Courtesy Wikimedia Commons. Like most survey courses of early American history, mine is pretty dry—most of the action takes place on land. For me, a typical survey starts salty, with Columbus’s voyages, slave trading, and pirate raids front and center. But once we get the Puritans off the Mayflower, it’s good-bye boats and hello farms, cities, and movement overland west. Of course, maritime affairs pop up occasionally with the Tea Party and smuggling before the Revolution, and no course on early America would be complete without the strange practice of impressment before the War of 1812. By the time Andrew Jackson appears, however, I rarely turn back to the sea. Maybe I mention the iron-clads in the Civil War. But that’s it. My approach is typical, but it leaves out the seafaring experience at the heart of the Americans experience. I’m a maritime historian, so I don’t really have an excuse. It’s not ignorance. All I can say is that I love the fresh air of teaching topics I don’t research, although that leaves me in the uncomfortable position of preaching what I don’t practice: Maritime history is important to teach. The ensuing contributions to the series reflect on the challenges and benefits of bringing the sea into the classroom, and they provide practical examples for colleagues, like me, who aim to introduce more maritime material into their teaching. We will hear from an impressive lineup of scholar‒teachers, mostly historians but also literature scholars, all discussing some aspect of how courses can be enlivened with a burst of salty spray from the past. Some contributors will show how to hook maritime topics onto fields such as foreign affairs, the environment, and the development of capitalism. Other posts will explain how map making and map reading help sharpen students’ spatial reasoning skills and how the digital humanities can capture students’ attention. Every institution has its peculiarities that can hamper as well as enhance courses on maritime subjects. We will hear contributors talk about teaching the sea at schools in the American heartland, far from the shore, where students can see the sea only after a long trip. We will also hear what it’s like at the opposite pole: teaching students at the United States Naval Academy, whose careers are dedicated to the sea. Finally, there will be privateers and pirates. No need to say more. By the end of the series, readers will possess a trove of new ideas for how to bring the sea into the classroom—and make their courses a little less dry. David Head teaches history at the University of Central Florida in Orlando.